It’s an overcast morning but cool. Typhoon season will be coming soon and that normally brings a great deal of humidity but for now the humidity is blissfully absent. I finish my coffee and head down the road. Just past the Nathan and Jordon Rd intersection, I turn left, passing two policemen. They have stopped a couple of young men in a doorway and are checking their ID cards, while wearing expressions that are both impassive and no-nonsense at the same time. The men being stopped are equally impassive; it’s all just part of a typical day under the new order. On Bowring st, I watch a master of balance and logistics at work as he maneuvers his ancient bicycle – carrying no less than FOUR large acetylene tanks between the mass of taxis, Mercedes Benz and buses. I have my camera with me, but by the time I get it ready, he has already disappeared into a building site entrance across the way. Down onto Canton Rd, I stand in awe in front of the Gateway plaza, which dominates this part of the waterfront. It stretches for 3 or 4 city blocks, all polished sandstone, glass and chrome. Inside, the place is vast! A row of fake Christmas trees divides the center of the plaza, between the shops selling all manner of designer brands. The row of trees stretches as far as the eye can see in both directions. Christmas might not be a traditional Chinese holiday, but that would never stop the shopkeepers. Outside, businessmen in Armani suits with leather briefcases stroll purposefully in and out of buildings, while gleaming limos fight their way in and out of the traffic, weaving between old diesel-powered buses and coolies on bicycles. The day is heating up although it remains overcast as I continue along Jordon Rd, looking for the jade market. Eventually I find it on Nanking st. It’s gone significantly upmarket since I was here last; Now most of the traders and carvers have their own shops with modern glass display cases and subtle lighting that wouldn’t look out of place in any of the jewelery shops in the Golden mile – a far cry from the open-square, plywood tables that used to cluster together on a tarp-covered site on the Reclamation Rd. The old Reclamation Rd site is now a large food and general goods market with vendors selling everything from fresh fruit and vegetables, to dried squid, crabs and prawns and all manner of general goods. The mix of smells – both sweet and spicy, salty and savoury assaults my senses at first…and then entices me further. This is the other side of Hong Kong and it’s a far cry from the glitzy fashion stores of the Golden Mile. By 2pm it’s uncomfortably warm and I head up to Peking Rd. Between the camera and jewellery shops I spot a fruit juice vendor and I buy a large cup of freshly squeezed mango juice. It’s like a Slurpie; almost chewy but chilled and I spend 15 minutes window shopping while draining the cup. Suitably refreshed, I head back over to Temple st, to visit one of the most well-known and popular local shrines. It’s an impressive building, sitting in a courtyard of huge wisteria trees. On a nearby table, a couple of old men are playing a game Go, pushing black and white stones around the board in the emerging afternoon sun. As I enter the shrine, the smoke from the incense coils that hang from the ceiling is over-powering at first, but gradually my eyes stop watering and I adjust to the relative gloom. On either side of the shrine’s inner sanctum sit an array of fortune tellers, most of whom are starting to do a brisk trade. I approach the ornate altar which is fashioned from rosewood, gilded with gold leaf and upon which sits a large statue of the Amon Buddha in the traditional Lotus position. Fearsome-looking warrior figures in the regalia of the ancient imperial guards and armed with fighting pikes stand on either side of the alter, forever watchfull. I make a small donation and light a joss stick before offering a short prayer for the health of my family and friends. Outside the shrine, a beggar leans on crutches. His left leg is missing from the knee down and he looks imploringly at me. I fish a note from my pocket and press it into his hand. My feet are aching a little now so I sit in the shade of a grove of huge wisteria trees in the square outside the temple. Directly across from me is a coolie, sitting on a bench with his eyes closed, perhaps in quiet contemplation at the end of a days work (which probably started before dawn). Across from the square and up the road slightly, is a series of fruit stalls. An old woman patiently peels lemons and limes and threads the peels onto strings, which are hung along the railings. The sweet, tangy smell of fresh citrus reminds me of home. Time to move on and I head back to the hotel on Kimberley st, dodging around the ever-growing multitude of shoppers, tourists and touts offering me copy watches or trying to entice me into tailor shops. The air-conditioning of the hotel is very welcome and I gratefully kick off my shoes before crashing out for an hour or so. Just after 6pm and freshly showered, I head out to the night markets. On Woosung st, I’m a accosted by a diminutive restaurant worker. What the hell…the night market won’t get going properly for at least an hour and the food smells good. The owner sets up a folding table right there on the footpath, places a cheap plastic stool in front of me and motions me to sit as he disappears into the tarp-covered “kitchen”. Moments later, he emerges with a laminated menu, a bottle of cold beer and – bizarrely – a roll of toilet paper, all of which he places on the table. Class! As dusk beckons, I sit with my back against a steel scaffolding pole, drinking cold beer and watching the world go by. A couple of overweight American tourists walk past and give me an odd look; more fool them – I’ve been here before and I KNOW that this is kind of place where the best food is often found. I wasn’t wrong. After dinner I tear a few sheets off the toilet roll to wipe my hands and then wander round the corner into the night markets, which are now in full swing. All manner of novelty trinkets and gadgets are on sale, along with various silk goods, the inevitable copy watches and childrens toys. The place is heaving with people (Hong Kong is DEFINATELY a night-time town!) 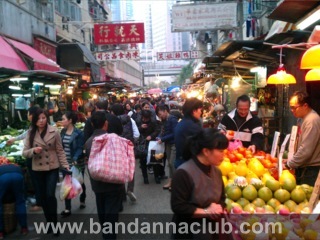 and I browse among the stands, bargaining for a few souvenirs, while erhu music mixes with the chatter of the traders. 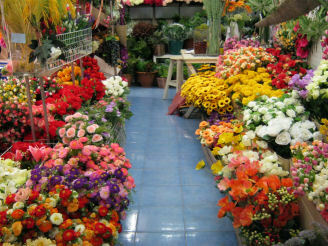 The smells of nearby food stalls mix with the ever-present scents of jasmine and wisteria. Time is getting on and I still have to get packed so I head back to the hotel, tired but happy after a day spent immersing myself in a place that I’ve always been fond of. It hasn’t changed much since the handover and most of the minor changes seem to have been positive. 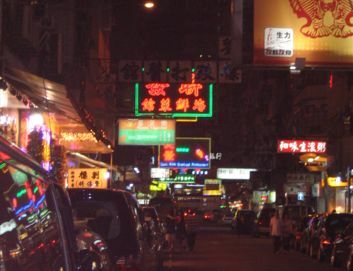 Sorry, comments for this article (Hong Kong Revisited) are now closed.